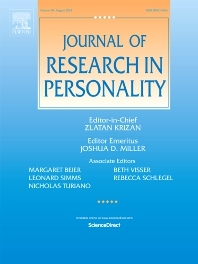 Emphasizing experimental and descriptive research, the Journal of Research in Personality presents articles that examine important issues in the field of personality and in related fields basic to the understanding of personality. The subject matter includes treatments of genetic, physiological, motivational, learning, perceptual, cognitive, and social processes of both normal and abnormal kinds in human and animal subjects. • Papers that present integrated sets of studies that address significant theoretical issues relating to personality. • Theoretical papers and critical reviews of current experimental and methodological interest. • Single, well-designed studies of an innovative nature. • Brief reports, including replication or null result studies of previously reported findings, or a well-designed studies addressing questions of limited scope.